Despite having just one skyscraper back in 1991, Dubai is now home to more than 900 high rises – and counting. 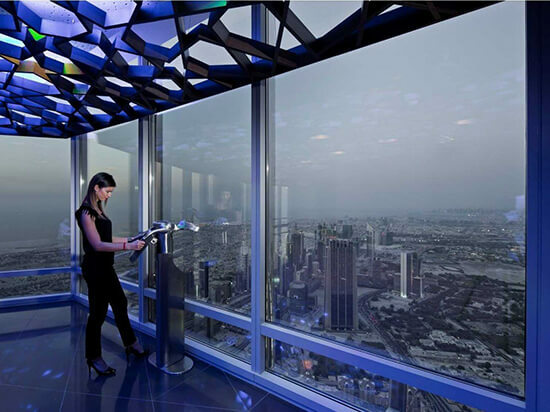 So architecture-lovers will no doubt be in awe of the incredible views from the floor-to-ceiling windows at The Observatory restaurant and bar, located on the 52nd floor. The incredible 360-degree lookout is particularly impressive after dark, when a warm glow emanates from the illuminated city below. It’s not all about city-life in Dubai, you can easily Escape to the coast to get your dose of sun, sea and sand at one of its many beach-side venues. 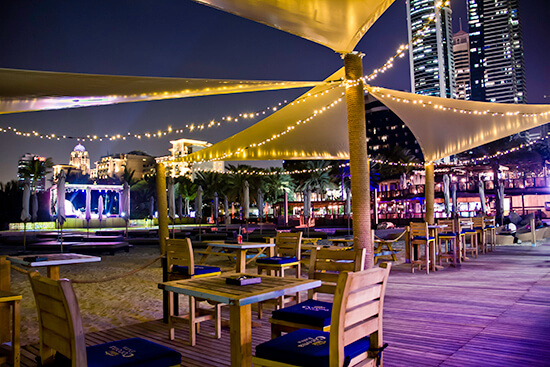 Barasti Beach is Dubai’s ultimate beach hangout and boasts beautiful views across the Arabian Gulf, set against a backdrop of towering skyscrapers. Here you can swim, sunbathe and sip on refreshing beverages to your heart’s content. What’s more, thanks to its desert location, it rarely rains in Dubai and the constant sunshine makes Barasti Beach the perfect spot to visit year-round. If you love a good steak then try Prime68, arguably the best boutique steakhouse in the city. As it is located on the 68th floor, dinners can admire stunning views of Dubai as they gorge on succulent steaks, sourced from top beef suppliers from across the globe and accompanied by delectable à la carte dishes. Prime68 has a fantastic dining atmosphere, enhanced by its stylish and elegant decor and mood lighting. The Burj Al Arab is renowned as the world’s only 7-star hotel, complete with its own private stretch of beach and a helipad! Not just that, but it’s also the most expensive hotel in the world: rooms cost between US$1,000 and $15,000 per night. Fortunately you don’t have to be a guest to gain access to this exclusive address – try dinner and drinks here instead, choosing from myriad restaurants and bars. 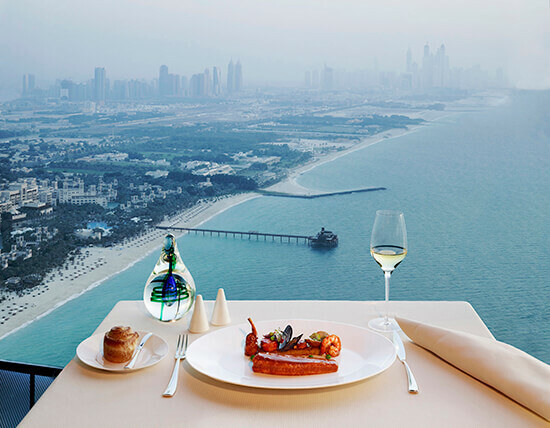 For world-class dining and a killer view, Al Muntaha is the place to go. Enjoying a cocktail with a view is always a good idea and, in Dubai, you will be spoilt for choice when it comes to sky-high rooftop bars. Head for Embassy and you won’t be disappointed. Whether you are looking to drink, dine or dance to live DJ sets, Embassy is the place to go: so get dressed in your best and enjoy an incredible evening at one of Dubai’s trendiest locations. 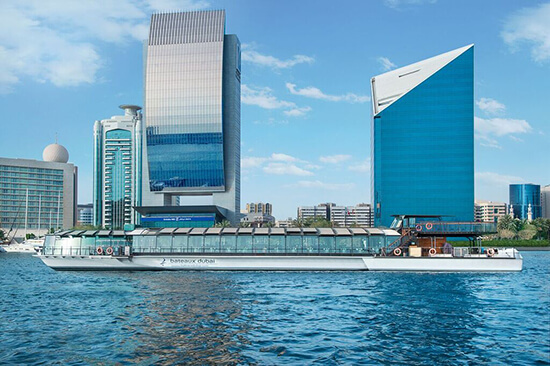 Taking a Bateaux dinner cruise is a chic way to see Dubai Creek, the historic part of the city. Diners can enjoy an exquisite à la carte dinner whilst floating down tranquil waterways and observing the city’s gaudy buildings as they glide past. It’s easily one of the most romantic ways to see Dubai, while its freshly-prepared nouvelle cuisine, served in a fully air-conditioned dining area, means it’s one of the coolest experiences too – in both style and temperature. The Burj Khalifa encapsulates the spirit of Dubai as a whole; it is grand, literally larger than life and utterly unique. It currently holds the title of the tallest building in the world, so it’s no surprise it attracts visitors from all around the globe. So for the highest view in all the land, head to the 148th floor, otherwise known as the world’s highest open-air observation deck. There is a plethora of options when it comes to getting a good view of Dubai, including hop-on-and-off bus tours, hot-air balloon rides and even helicopter flights if you’re feeling really flash. The city also has the longest automated rail network on the planet, so it’s no surprise most of its routes boast great views too. Ready to soak up some of Dubai's most amazing views? Speak to one of our Travel Experts about booking your trip today - whether you're seeking a beach holiday or a weekend stopover en route to Australia. Hello! I'm Keyta Hawkins, a wanderlusting twenty-something from the UK. I grew up in Cornwall by the seaside with my Filipino mother and English father. I'm an international travel writer, accredited freelance broadcast journalist and of course the creator of The Wayfarer. Let's explore? Fellow Wayfarer.